A new tweak in Cydia Store allows you to easily change between different Apple IDs account on your jailbroken iPhone, iPad, or iPod touch. The tweak called AccountChanger lets you put any Apple account on your account list and just click the email address , then login and it will log you in to the Apple account associated with that email. 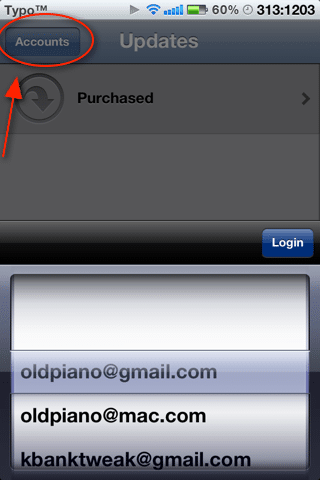 When AccountChanger is installed, an Accounts button will be added in the Updates section of the App Store. Password will be remembered so you won’t have to put your password everytime you change to another account in your list. “Accounts” button is added at Update section in AppStore. You can select an account want to login among .multiple accounts with different country. Password may be prompted when expired session. As the developer of this tweak stated, AccountChanger is in beta so you will find some bugs. Bugs, to improve this tweak, can be reported to @typ0s2d10 on twitter, if you find any. You can download AccountChanger from Cydia on Bigboss’ s repo for free.